In this tutorial I'll show you how to create a fantasy pathway scene. First we'll build the background from grassy ground and a forest. Later we'll add the tree, gate, small forest and pathway. After that we'll add the child and grass, and we'll make the basic light and color. Finally we'll add the light texture and make some lighting effects. Need more inspiration? 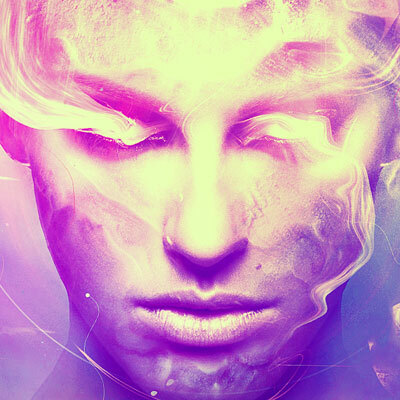 Create fantastical artwork of your own by using Photoshop Actions from Envato Elements. In this step we'll make shadows for the trees in the forest. We aim to make the main light source come from the middle of the forest so the shadows of the trees must be more visible. Create a New Layer and use the Polygonal Lasso Tool (L) to select the big tree on the right (no need to be so precise) and fill it (Shift-F5) with black . Create a New Layer and change its Blend Mode to Soft Light 100%. Use a Soft White Brush to paint more light for the middle of the forest. Isolate the tree and add it to the mid ground. Use Control-T to decrease the length a bit. Create a New Layer and use a Soft White Brush with a low Opacity (about 15-20%) to paint along the tree contour to make some hazy light on there. Use a Layer Mask to blend the gate with the tree. Duplicate the forest layer and make it much smaller. Set this layer under the gate layer and above the tree ones. Use a Layer Mask to remove the forest part outside the gate. Select the pathway from the original image and place it in the foreground. Use Control-T with Warp mode to bend the pathway a bit. Duplicate this layer twice and resize them down. Arrange them inside the gate and the small forest. The further away they are, the smaller they should be. Select all the pathway layers and press Control-G to make a Group for them. Change the group mode to Normal 100%. Create a New Layer and use the Clone Tool (S) to remove the unwanted plant shown on a step of the pathway. Create a Curves adjustment layer to darken the pathway as it looks too bright compared with the background at the moment. Paint on the top of the pathway (the part inside the gate and small forest) in order not to change its lightness. Add another Curves adjustment layer to increase the hazy light of the pathway top. Erase the rest to make it still dark. Cut out the child and place her onto the step on which we removed the unwanted plant. Make a New Layer under the child one and use a medium-soft black brush with a low opacity (20%) to paint a shadow for her. The child is far from the two light sources so the shadow should be very light and soft. Use a Curves adjustment layer to darken the child. Paint on the parts which are towards the light (the front) and keep the others dark. Apply a Gaussian Blur of 8 px to each of these grass layers. Use a Curves adjustment layer to darken the grass a bit. The selected areas show where to paint on the layer mask. Make a Vibrance adjustment layer to enhance the whole effect. Reduce the saturation on the tree and the pathway on its layer mask to make them less blue. Use a Layer Mask and erase the effect on the tree, making it appear more subtle. Make a New Layer and use a medium-hard brush with the color #ffadc4 to paint the pink/purple light reflection from the small forest on the gate and the steps of the pathway which are located inside this forest. Use a Curves adjustment layer to change the light and contrast of the whole scene, darkening the edges and leaving the light in the middle. I hope that you've learned something useful for your future projects. Feel free to leave your comments in the box below—I'd love to see them. Enjoy Photoshopping! Get more done with unlimited access to superb graphics and resources from Envato Elements. Browse the amazing selection of Photoshop Actions to apply insane effects to your photos in less time! Rise from the ashes like the hero you are with this Photoshop action. This action let's you instantly transform your photos into powerful, fiery portraits with just the click of a button. Simply fill in your subject with color and press play. It's that simple!